If your opponent controls 2 or more monsters than you do, you can Special Summon this card (from your hand). You can only Special Summon 1 "Phantom Night Dragon Seiyaryu" this way per turn. This card can make a second attack on monsters during each Battle Phase. Changed its effect to a double attacker (I felt giving it the capacity to field-wipe the opponent on its own initially was too much). Double attacks are on monsters only; meaning you CANNOT use this to wipe 5k off of your opponent. Let's just say that I was reading that Tri-Horned Dragon topic in TCG, and someone wished for remakes/retrains. Name is kinda bland though, but what am I going to do about it? Basically tried to retain the naming pattern, while keeping it different enough. Anyway, effect is basically reflective of one of its powers in the video games (especially Falsebound as it allowed multiple attacks on an opponent). First effect (built-in SSing) is basically there to discourage swarming on your opponent's end, since if your opponent does swarm, you get this out for free. Of course, because the SSing requirement only needs that your opponent is beating you in field advantage, there poses a problem with free multiple copies in hand. Thus, I have added an OPT restriction on it. Still, a 2500 ATK monster that can hit all of your opponent's 'mons is still powerful. As for the Typing, I borrowed from Metaphys Armed Dragon. Reps given to those of you who provide proper reviews. Edited by Sakura Haruno, 21 May 2015 - 07:43 AM. 2x attacks on monsters only; if you're going to direct attack, you only get one hit. Might as well give this a bump. As shown from the design notes, I've nerfed it down a bit, so this doesn't become a walking field wipe or 5K wrecking ball. Probably thinking of changing the OPT summon of this card to a SS lock (you can't SS other monsters the turn you summon this). 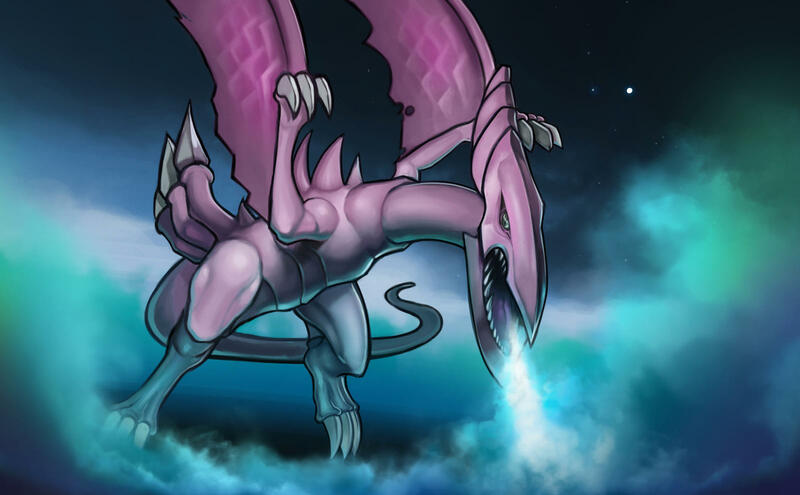 I think a better name would have been just Mystical Night Dragon or Sacred Night Dragon, without the Seiyaryru part (as that itself means "Holy Night Dragon"). The effect is pretty good, feels kind of old school but still relevant. It can give you a free beater, tribute, a material for another card, or even just a wall. The attack effect, or at least how it's read, is a little weird. It's kind of like Barbaroid's effect ("This card can make a second attack during each Battle Phase. This card cannot attack your opponent directly.") but without his main drawback. Maybe add in a burn effect, like 500-700 points? I think that would tie in more with the flavor text of the original. Otherwise, good retrain, good art, it's very good all around. I'll see what I can do about it, but certainly can be fixed so it can fight with other relevant threats. For the attack effect, it can make two attacks on monsters, but if you choose to direct attack; you only get that one shot. 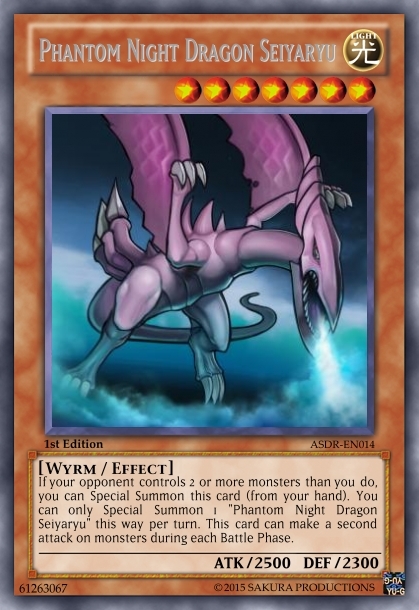 Originally, I did have it being capable of attacking all monsters your opponent controls or removing the monster thing; but toned it down because 5K direct damage from an easy to SS beater is not fun to face. Burn might be an option, but I'll have to repost the changes later in a new thread. Naming-wise, that might work (although I probably borrowed too much from Metaphys Armed Dragon in terms of that). Out of fairness, I have to lock my own thread due to the necrobump thing; but don't worry about it.